It’s a cute little Dalek and I’m calling him George. 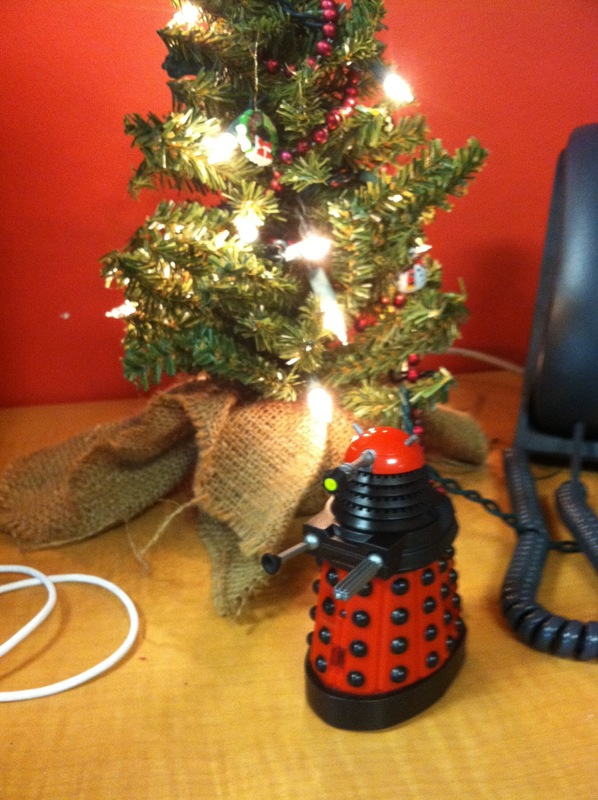 He rolls around my desk and says, “Exterminate!” when he bumps into objects. Crow gave him to me for Christmas. My coworkers are less thrilled with him than I am. Can’t anyone appreciate at genocide-wreaking genetically engineered mutant cyborg that slightly resembles a garbage can? I hope your holiday was nice… Mine was a little different for a change. I guess it’s time to start some new traditions. This trial run was a little rocky, but it turned out all right. I think I drank too much on Christmas day–had two and a half Christmas ales with my dad (Great Lakes and 12 Dogs) and a stout. I spent all day yesterday battling a little bit of vertigo and nausea. I’m certainly getting old; can’t hold my liquor anymore! I got a lot of great gifts and now I’m feeling a bit guilty, like I spent less on everyone else than they did on me. I don’t know what I did to deserve such lavish gifts from everyone, but thanks a million, all (and there was more than one of you). I guess I’ll have to be extra kind in 2012 and also remember the kindness next Christmas. I always thought myself pretty generous when it comes to gift-giving, but some of my friends and family have proven themselves even more generous than me! I love all my gifts, though–not a single returnable item among them! I broke one of my own rules yesterday: I rode a bike with the temperature below 40 degrees. But it was for a good reason. A tradition in my bike club is to ride a night through Silver Lake (an upscale neighborhood near where I live) to view the Christmas lights. As part of the tradition, riders are invited to decorate their bikes or their person accordingly. In year’s past, this ride has motivated me to consider riding in the frigid temperatures because I love decorating for Christmas and I doubly love viewing Christmas lights. However, the one year that I came closest to actually doing the ride, the temperature was below 0F. That particular day is still regarded as one of those epically awful rides where a few members slipped on ice, another member never completely warmed after the ride, and someone else rode 200 feet before returning to his truck and, according to legend, sleeping until the rest of the riders came back. In contrast, this winter has been extremely mild. We’ve only had a few light dustings of snow thus far and the temperatures have barely dropped to 25F. Since it was looking as though the day would be dry and in the 30s, I decided I would attempt the ride even though it was still a bit of a colder environment than I usually voluntarily ride in. Having a boyfriend who does not get stopped by colder temperatures (or even a blizzard–he was also at Ludicrously Cold Christmas Lights Ride mentioned above) is also motivation. So there was pretty much no doubt that I would do the ride. I got especially excited when Crow showed me where I could find battery operated Christmas lights at the local Target. And they were on sale, even better! I bought two 9 foot strings of LED lights and happily strung them to the top and down tubes of my trail bike Mike. I have not ridden the Mike bike in quite some time, but I recently had him tuned up at Century Cycles. I’d been dying to take him out for awhile but hadn’t had a good occasion to do so. As added inspiration, I grabbed some scrap garland I had in my Christmas decorations and threaded it about the handlebars. 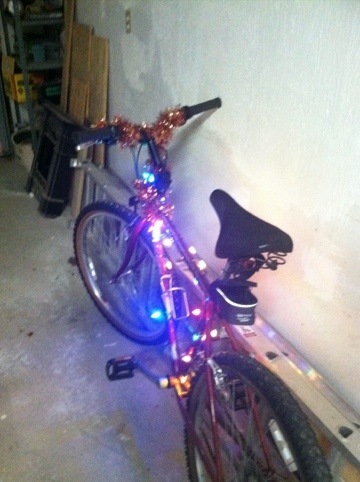 The Mike bike decked out for the holidays. I was so excited when I saw my bike all decorated like that. 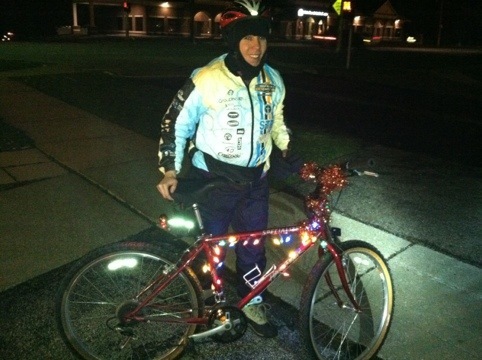 Crow also had lights on his bike–some blue LEDs he’d bought the year of the Ludicrously Cold Christmas Lights Ride. I gave him another piece of garland which he also added to his handlebars. We were all set to ride in the spirit of the season. When I arrived at the ride (which started at Marty’s Bike Shop in Stow), I was happy to see that others had also decorated their bikes. 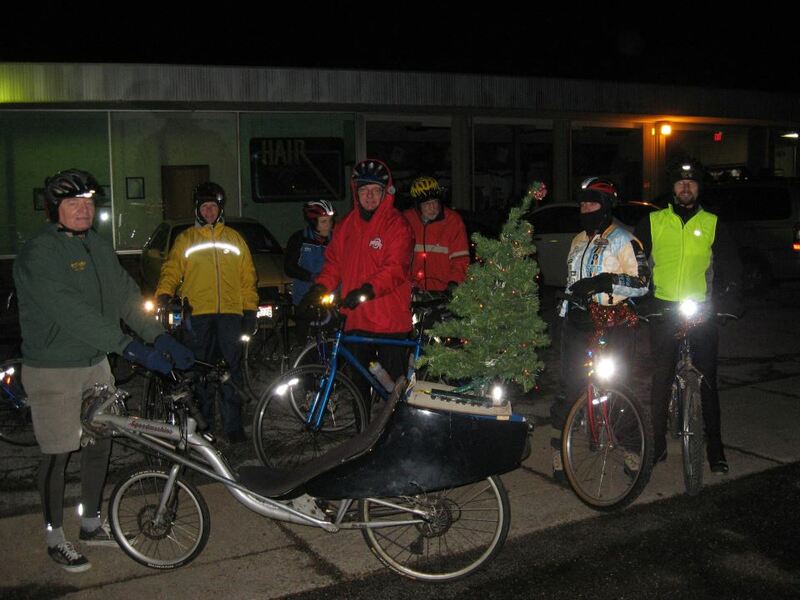 The best, though, was my “surrogate father” (inside joke), Ernie, who had placed a whole mini Christmas tree–complete with lights–on back of the seat on his recumbent. As we rode down the streets of Silver Lake in the dark, I felt like I was chasing a running Christmas tree (which was a funny imagine in and of itself). You couldn’t see Ernie behind the spectacle of the tree. 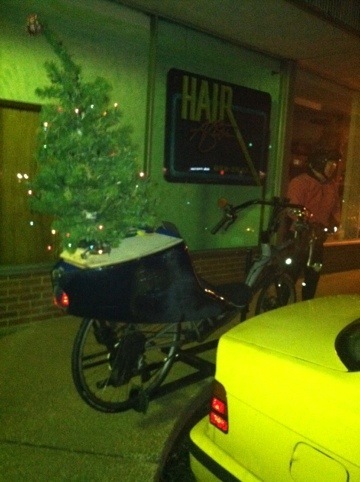 A little Christmas tree strapped to the back of Ernie's recumbant. Quite a good turn out of the ride as well–about 12 people! I think that’s probably a record number of riders to show up for this ride and I am sure it had to do with the mild temperatures. The merry cyclists gather for the Christmas Lights Ride. We did make quite an impression where-ever we went. As we passed one decorated house, we could see a party taking place inside and the guests were peering out the windows at us and pointing. Several people walking dogs or in passing cars shouted, “Merry Christmas!” as we passed. We even shouted it at passers-by, but I admit that I felt a little bad starting it without the spectator saying it first… Is it bad for us all to assume everyone is celebrating Christmas? What if the passers-by were Jewish or Muslim? I felt a little guilty and ethnocentric. I hoped that no one took it the wrong way, like we were some sort of pushy Christian group trying to put the Christ back into Christmas… I can’t help it–I’m a liberal and I’m always worried about offending other people. Even on a small thing like a Christmas ride. But it’s food for thought. I have many friends from many different faiths and lifestyles… So I’m doubly aware of diversity. I wanted to shout a general “Happy Holidays!” but I guess when you’re in a group of people, you hate to be the one dork with sensitivity training ruining the fun for everyone else. I’m really bad at trying to set an example for others. I also do my best to blend into whatever group I’m amongst. Mars Girl (dressed for a blizzard in four layers) and the decorated Mike bike. I'm smiling! Good sign! Anyway, the lights were spectacular. Especially in the more affluent sections of town. I admit that I’m not a huge fan of those blow up lawn ornaments–I think they are kind of gaudy–and it seems that most of the affluent members of the community agreed. I have no problem, however, with tons and tons and tons of lights. Such decoration makes the night look enchanting and mysterious. I especially love those soft blue LED lights–they are like starlight sparkling on snow. I would love to decorate my entire house with them because they twinkle in the night air like a pocketful of stars. I could have my own little universe on my own little house! Decorated cutter cookies by Crow and Mars Girl. My boyfriend Crow and I decided to make Christmas cookies this year. I’ve always wanted to make a bunch of batches of cookies and then pass platefuls of them to coworkers and friends. It just seemed a nice, festive activity. I love the holidays. We ambitiously decided to take on making six different kinds of cookies. If you know Crow, you know this kind of ambition is not unusual. And for once I got swept up in the thrill of it. It’s hard to pick just one or two types of cookies to make amongst the millions of different kinds there are out there to make (and eat). We both wanted to do it all. We ended up selecting to make peppermint pinwheels, chocolate almond rosettes, cutter cookies with frosting, whole wheat gingerbread, spritz, and peanut butter blossoms. We had wanted to make snickerdoodles, but they missed the cut since we wanted to make some cookies that were different than the standard Christmas cookies everyone else makes. We decided that we were going to make our cookies out of as many organic ingredients as we could. The peanut butter blossoms, for example, had Hershey kisses, which were not organic (though we would have bought some had we found something like a Hershey kiss that was organic). The flavoring extracts (vanilla, peppermint) were not organic nor was the food coloring or the decorations for the cutter and gingerbread cookies. We blocked off the entire weekend of December 2-3 for making cookies. We started our cookie baking with the peppermint pinwheels because the dough is refrigerated for at least eight hours. We made the dough and rolled it into two swirled loaves on Friday night. On Saturday, the first thing we did was cut the cookies, put them on sheets, and began baking them. I was amazed about how the two doughs rolled together actually congealed overnight so that they were one in the loaf while maintaining their swirl color. They came out extraordinarily well. Crow and I both love peppermint flavored goodies (ice cream is the best!) so we were pretty happy with the results. I loved the smell when you opened the oven–warm peppermint flooded the nose tauntingly. Next to the scent of pine trees, the fragrance of peppermint is definitely one that makes me think of Christmas. The recipe also makes a ton of cookies (somewhere in the range of four dozen!). They are small cookies so they don’t take up much room when packed up. We next attempted to make what we figured to be the next hardest cookie–the rosettes. I must explain that finding the rosette irons required to make this cookie was like trying to find the Holy Grail except, as Crow pointed out to me, everyone knows what the Holy Grail is. Even at specialized cooking stores, we were often met with a blank stare when we asked for rosette irons. At places where the associates knew what we were talking about, we were told that they didn’t have any and weren’t expecting to get any any time soon. We did find a set of three rosettes, buried on a low shelf, at one specialty cooking store but we didn’t buy them because the only shapes were not at all Christmasy–a butterfly, cloverleaf, and the basic rosette pattern (like a flower). We knew that Christmas patterns existed out there (the picture of the rosettes in my cook book were a Christmas tree and a snowflake) and we were determined to find them. The funny thing is, the harder those damned irons were the find, the more I wanted to make them. I had delusions of returning the lost art of rosettes to the western world. I swear I’d eaten them once, somewhere in my distant past, but I couldn’t remember where. When I described them to my mom, she also had a distant memory of having had one before. Perhaps my Aunt JoAnn–the cookie guru of the family–had made them before. Finally, after Crow vented his frustration on Facebook, a mutual friend contacted me to tell me that she had a set to sell us and that they were, in fact, Christmas-themed. (Thank you so much, Cheryl.) We were a little disconcerted, however, that a self-proclaimed cookie expert such as Cheryl was so willingly give up her only set of the rare rosette irons… That did not bode well for the ease of making the cookies. Crow had a fryer. We used Safflower oil (healthier?) as the fry oil. Our first attempt to make the rosette was a fail. We either didn’t put enough of the batter onto the rosette iron or the iron wasn’t hot enough because it stuck to the rosette. All my hopes and dreams of re-discovering the love of the lost rosette cookie were starting to fade. I tried a different iron while Crow frustratedly removed the fried batter from the Christmas tree rosette. The second attempt with a snowman iron worked a little better, but the cookie was still sticking a bit to the iron. The whole process was starting to look like a two-man operation and we didn’t have that kind of time–Crow needed to be starting the next batch of cookies. The rosettes finally started sliding off the iron better–maybe it was because the iron or the oil were hotter. After awhile, the rosettes were actually falling off of the iron while still in the oil, so I suspect something wasn’t quite right. Also, my rosettes looked a bit puffier than I thought they should. I continued making them until the batter ran out but I was not entirely happy with the end result. They seemed crisp immediately out of the fryer, but after they sat for a bit, they got soft. I proceeded to decorate them with frosting and glitter. I never tried to eat one, regrettably. I had bits and pieces of the broken one that Crow had pried off of the first iron and it tasted good. After they got flabby, though, I was too depressed to try one. That did not stop me from adding them to the plates I later distributed to friends and coworkers. While I struggled with the rosettes, Crow made an excellent batch of peanut butter blossoms. They were tasty and crumbly. Perfect. But they only made about one dozen so we decided that we might make a second batch later. Next, I made spritz cookies while Crow made the cookie cutter cookies. Both of these cookies use roughly the same ingredients so we figured it would be easier to share the mixer. Crow’s cookies turned out great. After mixing my ingredients, I had a very dry dough that didn’t seem like it would work in the cookie press very well. And, in fact, it didn’t–the pieces of cookie coming through the little tree-shaped pattern kept breaking apart into separate piles of un-congealed dough. That is, when they managed to come out of the press. I thought the mix needed some moisture… so I added water. Big mistake. Now I had a gooey mess. I trashed the first bowl of dough. It fell into the garbage can like the ectoplasm from a ghost in the movie Ghostbusters. I tried to make the dough a second time. I followed the instructions exactly, slowly adding the flour mix, and it seemed to work at first. However, the dough still seemed a little dryer than I remembered it should be (my mom used to make these cookies). Still, I again tried to run it through the press. The dough would come through the press, but it would not break off and drop onto the cookie sheet. I later discovered that I had the press plate in backwards. I didn’t know this at the time, though, so I just gave up and rolled the dough flat to make more cookie cutter cookies since the consistency was right for that. Crow started making gingerbread cookies, but at about that time, we had to be cleaning up because Crow’s friends were coming over for a game night. We were also partaking in a cookie exchange (more cookies!) so things started to get a bit hectic as Crow ran off to pick up the lasagna for the night’s dinner and I assembled cookie plates for the cookie exchange. At that point, our cutter cookies were baked and cooled, but not decorated, so I did not use those for the cookie exchange. 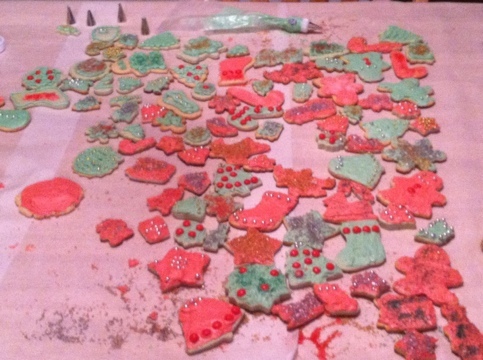 We had to table the rest of our cookie making efforts for the next day. 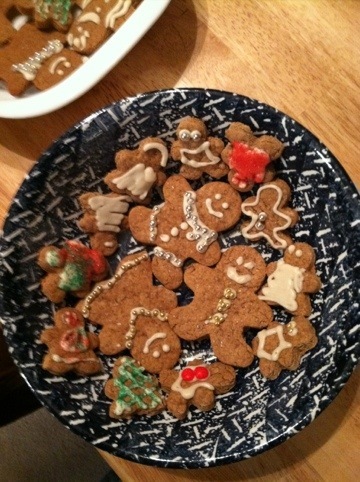 Decorated whole wheat gingerbread cookies by Crow and Mars Girl. Sunday afternoon, we started making cookies again. This time, I started a new batch of gingerbread cookies (we had to throw out the rest of the dough from the batch Crow started the night before–don’t ask) while Crow attempted the spritz cookies for the third time. He actually got them to work out (with the press plate in the correct direction) but after three or four sheets of making them, he got tired of working the press (which is not as easy as it looks) so he just made drop cookies out of the rest of the dough, turning them into what he called “not peanut butter cookies” and “not peanut butter blossoms” as the cookies looked suspiciously like one or the other. 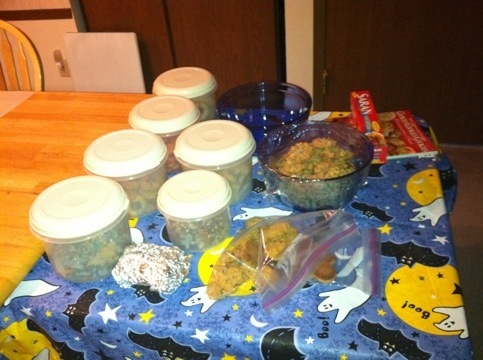 By the time we finished making these two batches of cookies, we were getting pretty tired. Still, I mixed up a batch of red and a batch of green frosting and we decorated the oodles of cutter cookies through tired and blurry eyes. I thought Crow did a better job overall of decorating than me. Mine tended to look like a 3rd grader had decorated them… I’m just not that good at visually artistic things. Crow used one of those frosting tubes to make even cooler designs with his cookies. I tried one of the small cookies with frosting. Mine might not have looked good, but they tasted great! We still hadn’t decorated the gingerbread cookies, but by that time, we were pretty much worn out from cookie baking. We decided to resume our efforts later in the week. Which turned out to be Wednesday. I made one more batch of frosting, this time without food coloring, while Crow made a second batch of peanut butter blossoms. I decorated the gingerbread cookies but let Crow finish them while the peanut blossoms were cooling because I just got too frustrated with my lack of artistic ability (I have much better ideas in my head than what my hands can make). Oh well. People eat the cookies ultimately after all. So I suppose they aren’t spending much time admiring their beauty first. Once I started loading those cookies onto plates for my coworkers, I felt a little better about the results. The cookies did look nice–if not as nice as I imagined them–and it was fun preparing the plates. I enjoy giving people gifts and I knew my coworkers would appreciate this little surprise. Crow brought some cookies to his customers, too. For a day, we were both little Santa Clauses. Despite what I perceive as a failure, I would like to attempt the rosettes again. After all, we went through all that trouble to get the damned irons. I’m still determined to bring back the lost art of rosettes… I will become the rosette expert, darn it, or brand myself trying. Crow and I are also thinking of making another batch of the peppermint cookies to bring to our families for Christmas. I really, really liked those; they were definitely my favorite cookies of what we made because they were so different. I found a recipe online that suggests adding baking cocoa to the other layer of dough to make chocolate peppermint swirls. For. The. Win. I recently started to focus on buying organic food. Since reading Fast Food Nation by Eric Schlosser while on vacation in 2005 (totally not a vacation book, by the way), I’ve been worried about the hormones injected into our food by the mega-farms to hasten the growth process of the animals we eat. While driving through Nebraska once, I saw many meat cattle farms in which hundreds of cows were penned up together to walk in their own manure because there was nowhere else for them to move. The farms smelled horrible. For miles before and after, even. I worried about the quality of the meat in these pens where they couldn’t move. It had an effect on me that brought me to read Fast Food Nation in the first place. For the most part, though, I’ve been pretty lazy about following through with buying organic. It’s expensive. It’s hard to find. There are less choices with brands and less diversity of selection (ie, if you’re looking for a particular flavor). Thus is the problem with trying to eat more healthy in this nation: the better food is practically inaccessible to the average person, especially in the Midwest. But I can’t say that I ever stopped thinking about what I learned in Fast Food Nation. Nor could I get the image of that penned up cattle out of my head. I did make a step to reduce the demand on meat: I made an effort to reduce how much of it I personally ate. Most days, I only eat meat at one meal (usually dinner). About once or twice a week, I manage to go an entire day by deliberately choosing to not eat meat. I know I’m just one small person. But I guess in the case of trying to conserve our planet’s resources, I have to just comfort myself with the fact that maybe I’m not helping to contribute to the overall problem because I’ve reduced the overall demand by reducing my personal demand. I try to preach these values to other friends without being too pushy. I can only hope that others also made a conscious effort to reduce the amount of meat they eat. It’s the same concept as how I feel when I trade two or three days a week of my commute to work by car with a bike in the summer. If everyone did that, just think about how much gas would be saved. And it’s not a huge sacrifice–I’m not saying give up your car, nor stop eating meat. I’m just saying reduce how much you consume. I know that realistically if I’m the only person taking these steps to reduce the demand, I’m not really changing anything. Much like my deliberate boycott of Wal-Mart, which my parents are quick to point out, Sam Walton’s kin could care less about since I’m just one person. But at least I’m not contributing to their wealth and seedy business practices. I don’t want to become obsessed. It’s just that when you look at the high occurrences of obesity, cancer, diabetes, asthma, and other illnesses in our society, you have to start to ask yourself just what we’re doing wrong. There has to be a cause. I’m completely convinced that our obesity and diabetes rates can be tied to mega-farms and their hormone-injected food (which also accounts for incredibly early onset of puberty for women these days) as well as our over-sweetened food. I am starting to suspect some of the pollution and other irritants in our environment are leading to more cases of asthma. Other illnesses may be tied to high exposure to other things in the products we use every day that are simply not healthy. I just don’t know what all this means. I’m not a scientist. I can’t conduct experiments with controls. I’m just saying, though, that my mind is starting to shift a little… I’m asking questions. I guess my biggest moment of revelation happened a few weeks ago when, after having only eaten Kashi shredded wheat (Island Vanilla) for breakfast for about a month, I switched back to my old favorite Post Shredded Wheat (because it was on sale). I was about halfway through my morning bowl of cereal (dry with peanuts added in) that I suddenly thought, “This is way too sweet for my morning meal!” Kashi’s cereal is much less sweet. I guess I got used to it. And it occurred me at that moment why a lot of people I’ve known from outside the US complain that our food is too sweet. This notion was further confirmed when Crow was looking for a can of diced tomatoes that he was going to use in fajitas he was making for dinner. The ingredients listing for most of the cans revealed that high fructose corn syrup and/or sugar had been added. Why?! Do you pull a tomato off of a vine and pour sugar on it in order to eat it? Um… no!! Tomatoes have their own natural, wonderful sweetness to them; they don’t need additional sweetness! It made me wonder just how healthy the food I’m eating is even when I’m trying to eat healthy. How much of the food I eat every day for a meal contains extra sugar in it? I started using the application for the iPhone called Good Guide. You can scan products in the store and Good Guide rates the product based on its healthiness, its impact on the environment, and the company’s ethical practices. Questionable ingredients are flagged and noted by the degree of concern. Good Guide also suggests other products of the same type with better ratings that you might consider using instead. The guide is rated by a group of scientists and environmentalists with no affiliation to said products. Check out the video on their website–it’s really interesting. I realize that this whole thing sounds probably a bit wacky to my friends and family who have known me a long time. It probably looks like I’m starting to embark down the road to a type of fanaticism that inspires a lot of eye-rolling. Who has preached to me this crazy new age religion of purity in food and products? How have they managed to convert me? What’s going to happen next? Will you be raising chickens in your back yard? Oh, no! Never fear. As I found myself scanning products into Good Guide on my last grocery trip, I started to wonder about myself too. I think this is how it started with some of my friends who I consider a bit on the fanatical side. You buy some natural, handmade soap, then shampoo and conditioner. Then you use henna on your hair instead of chemical dyes. Then you’re scanning the toothpaste isle for something that doesn’t contain fluoride. And the next thing you know, you start only eating products with ingredients you can identify. It’s a downward spiral into a crazy land where you can only understand and communicate with the other inhabitants. And everyone thinks you’ve jumped off the deep end so they avoid discussing food or ecology with you. Then you’re labeled the family hippie and it’s all over. There is a certain satisfaction in knowing that I ate a dish composed completely of organic products, though. Or that I’ve chosen a healthier product over one that is questionable. I still think if I wisely reduce the amount of chemicals I willingly expose my body to, I’m going a long way to a healthier lifestyle. I know it doesn’t erase all the variables–people still get ill for random reasons. But maybe I can eliminate some potential problems that are proven risks (ie, the hormone-injected cattle, food with unnecessary sugar additives). It certainly doesn’t mean, however, that I can’t eat the food I’m being served at a friend’s house because I can’t trust its source. I still like to eat at restaurants, after all (though places like the Mustard Seed Cafe become more appealing choices). And I’m really not rude. Anyway, I guess I am becoming that hippie relative everyone mocks. Oh well. I have my reusable grocery bags and I’m happy. (SAY NO TO PLASTIC!) Talk to me if you want to know more. Talk to me if you want to tell me more. I’m all mouth and ears.